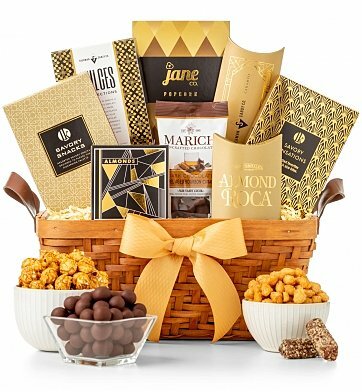 A golden collection of delicacies including bourbon caramel chocolates, Almond Roca and sweet toffee popcorn create a gift that is sure to impress. Fresh Nuts, Candies and more. Measures 11" x 9" x 6". Gold Ribbon Gourmet Gift Basket is a hand delivered gift. These gifts are delivered by one of our local design centers located throughout the United States and Canada. Same day delivery is available for most gifts when ordered before the cutoff time. The cutoff time for Gold Ribbon Gourmet Gift Basket is 1 PM in the recipient's time zone. With Toffee Popcorn, Bourbon Caramel Chocolates. Almond Roca, Pomegranate Truffles, Roasted Nuts and more. Arrives in a signature wicker basket with an attached card.